When pressing the DISPLAY button immediately after shooting, the LCD monitor would turn completely white, the camera would hang, and the images in the buffer memory would be lost. Countermeasures for this issue have been incorporated into this update. Errata in the German and Russian language displays have been corrected. This firmware update applies to cameras with firmware version up to 1.1.1 installed. If your camera’s firmware is already version 1.1.2, it is not necessary to perform this update. Three new languages (Russian, Traditional Chinese, and Korean) added to the camera menus. Improvement in communication reliability when using some CF cards. Improvements to AF tracking in AI Servo AF. Improves the AF tracking when using the AI Servo AF to shoot low-luminance or low-contrast subjects. Reduced noise when shooting bulb exposures. Reduces the color differences between RAW and JPEG thumbnail images when viewing thumbnails in the bundled RAW-image development application Digital Photo Professional. The heart of the Cannon EOS-IDs MarkII is a state-of-the art, 16.7 megapixel, full frame, single-plate CMOS sensor developed and manufactured by Canon. The 1Ds MrkII has the world’s highest pixel count in a 35mm digital SLR camera. Its maximum-recorded resolution is 4992 by 3328 pixels. Each pixel is 7.2um, smaller than the 8.2um of the EOS-1D MarkII sensor or the 8.8um of the EOS-1Ds it replaces, but supporting the same range of ISO settings and producing the same low noise as the 1D MarkII and surpassing the 1Ds on both counts. The 1Ds MarkII sensor shares with the 1D MarkII several substantial improvements made possible by the Canon-developed, on-chip RGB primary color filter together with larger micro lenses that have much smaller gaps between them than those on the 1Ds. These narrow gaps greatly increase the efficiency of light convergence while greatly reducing birefringence. Canon has also improved the design ofthe photo diodes in the CMOS sensor by eliminating transistors in each pixel, making a greater portion ofthe surface area of each pixel sensitive to light. Normally, it’s nearly impossible to provide both high resolution and minimal false color, but the EOS-1Ds MarkII has a 3-layer optical low pass filter that works with the DIGICII chip to reduce false colors while having minimal impact on resolution. A second-generation, on-chip noise elimination circuit attends to fixed-pattern and random noise. In addition to longer battery life, the lower power consumption ofthe CMOS sensor means that the Signal-to-Noise Ratio is less affected when the sensor’s temperature rises. For long exposures, including those up to several minutes, the circuit-driving standard current and the power to the output amp are cutoff and, as with the 1D Mark II, the camera applies Dark Frame Subtraction automatically. Additionally, the irregular image edge colors that occur during long exposures have been reduced dramatically. The next-generation DIGICII Image Processor in the Canon EOS-1Ds MarkII, as well as in the EOS-1D MarkII, features ultra-fast response and high performance. The single board design replaces the multiple boards of the 1D and 1Ds and the DIGICII itself is a single-chip unit whereas the 1D and 1Ds had two separate Image Processors. The DIGICII has a new signal processing algorithm, 8-channel signal reading and faster image data signal processing. Color reproduction of high-saturation, bright subjects is improved. Auto white balance is more precise and accuracy in low color temperatures, such as tungsten light, is better. False colors and noise in low light have been reduced. Canon’s new 16.7 Megapixel Digital SLR extends studio photographers options Canon, world leader in photographic and imaging technology, is pleased to announce the launch of its new flagship camera: the 35mm full-frame 16.7 Megapixel EOS-1Ds Mark II Digital SLR. The camera is expected to appeal to professional studio and commercial photographers. Featuring a full-frame 36 x 24mm 16.7 Megapixel CMOS sensor, the EOS-1Ds Mark II produces images with outstanding colour rendition and dynamic range. It has sufficient resolution to produce files which convert to 50MB uncompressed TIFF at 24 bit colour depth, now considered standard acceptable size by leading international photo agencies and stock libraries. Replacing the award winning 11.1 Megapixel EOS-1Ds, the camera is powered by Canon’s second generation DIGIC II image processor and is capable of firing at 4 fps for bursts of up to 32 frames in JPEG, or 11 frames in RAW. An optional wireless adaptor (WFT-E1 – also released today) delivers high speed IEEE802.11b/g wireless LAN and 100 Megabit per second wired LAN support. 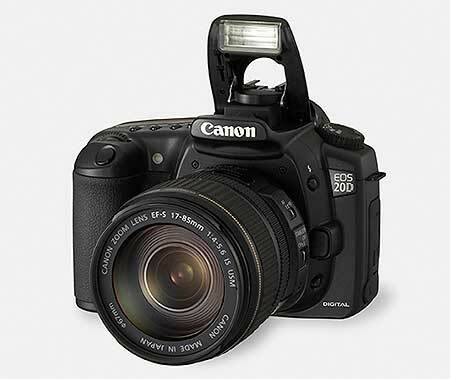 Besides the inherent advantages of digital, such as immediate turn-around and elimination of film costs, it is the flexibility of the EOS 35mm SLR format which Canon expects to appeal to many studio photographers. For the first time, medium format image quality combines with access to the world’s most extensive range of professional lenses, spanning from 14mm to 1200mm. The EOS-1Ds Mark II is a tremendous achievement, it represents the pinnacle of Canon’s digital camera technology, said Malcolm Hills, Head of Canon Consumer Imaging in the UK and Ireland. With its resolution, image quality, immediacy of wireless and the power and flexibility of SLR, the EOS-1Ds Mark II offers the first real digital alternative to medium format, which has so far been the choice for mainstream commercial studio and location work. Canon expects the camera to be adopted in areas such as fashion, car, calendar, advertising and architectural photography. The EOS-1Ds Mark II full frame 16.7 Megapixel resolution sensor has a built in low-pass filter to reduce false colour and moiré effects, which can appear when shooting subjects with fine regular detail, such as textiles. The second generation DIGIC II processor delivers 0.3 second start up time, fast continuous shooting and simultaneous RAW and JPEG recording. It also features advances in the image processing algorithms to improve white balance, auto exposure and overall image quality. Photographers can choose between four resolutions and 10 quality levels for JPEG images. Within the camera, the EOS-1Ds Mark II supports sRGB and Adobe RGB colour spaces with user settable colour saturation and tone levels, and provides five preset and two user-definable colour matrices. When using the Digital Photo Professional software and RAW image files, Wide Gamut RGB is also available. White Balance (WB) bias is correctable by +/- 9 levels for both blue/amber and magenta/green bias and the camera supports WB bracketing up to +/- 3 levels. Photographers switching to Canon’s EOS system open up access to over 60 EF lenses, including tilt-shift, macro, super telephoto and Image Stabiliser lenses. The EOS-1Ds Mark II is compatible with the entire range of EX-Series Speedlite flash units, including two macro set ups and a range of wireless master/slave flash solutions. For photographers comfortable with the vertical orientation viewfinders of some medium format cameras, the camera accepts an optional Angle finder C right-angle viewfinder. With the optional Wireless LAN adapter plugged into the camera’s IEEE1394/Firewire connection, photographers can work untethered as huge full-frame RAW files transfer automatically to the studio LAN in seconds. A London publisher can now lay out a production-ready front cover of a magazine with a photograph taken literally seconds beforehand in a Milan studio, observes Hills. Once this level of immediacy becomes commonplace, it is hard to imagine anyone accepting the risks and costs associated with the delays of film developing. The Wireless LAN adapter supports both IEEE802.11b, IEEE802.11g wireless network standards and also includes a 100 Megabit wired ethernet connector for automatic and immediate transfer to any wide or local area network. The system supports a comprehensive range of major wireless network encryption and security features. The EOS-1Ds Mark II’s CMOS sensor offers lower noise levels and a superior dynamic range (capacity to capture subtle tonal gradations in shadow, midtone and highlight areas) to that of sensors found in other digital cameras and camera backs. Canon is the only camera manufacturer with a history of significant research and development investment into image sensors. 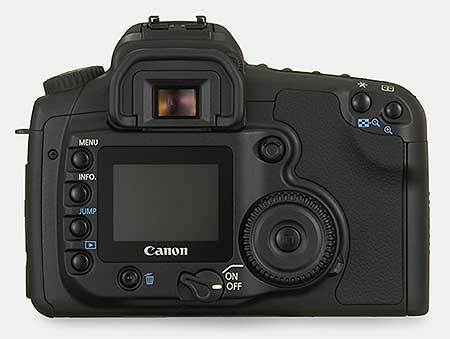 The resulting CMOS sensor technology found in its Digital SLR range is key to the company’s competitive advantage. CMOS sensors have formed the basis of a long line of award winning cameras including the EOS-1Ds, EOS-1D Mark II and EOS 10D. Such is the strength of Canon’s sensor development that this is the third new CMOS sensor Canon has commercialised this year. 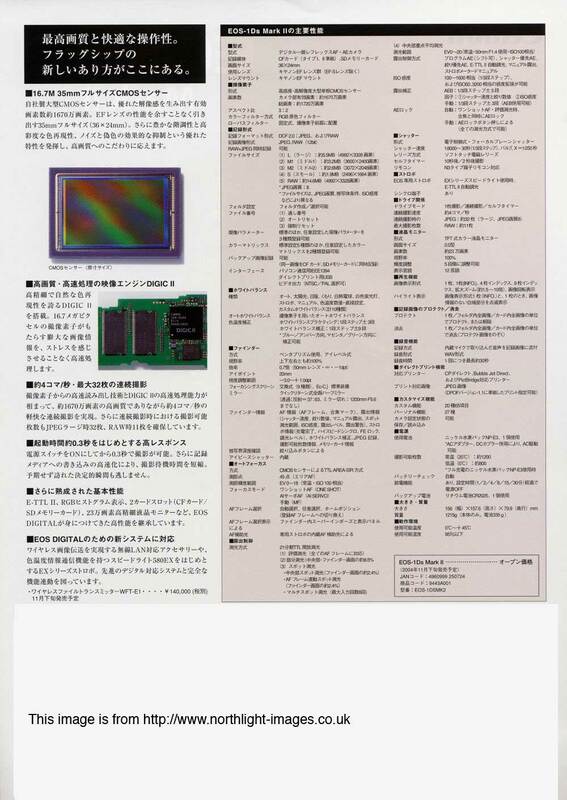 Canon’s first commercialised sensor technology formed the basis of the 1987 EOS Auto Focus system, with CMOS technology first appearing as an image sensor in 2000’s EOS D30. Digital Photo Professional v.1.5 image processing software is provided for high-speed processing of lossless RAW files. Processing with Digital Photo Professional is approximately six times faster than the File Viewer Utility supplied with the EOS-1Ds. It allows real-time display and immediate application of adjustments to images and includes a wide array of RAW, TIFF or JPEG image editing functions, which give control over variables such as white balance, dynamic range, exposure compensation and colour tone. sRGB, Adobe RGB and Wide Gamut RGB colour spaces are supported, and an ICC (International Colour Consortium) profile is automatically attached to RAW images that have been converted to TIFF or JPEG formats. This allows images to be displayed in true colours in software applications that support ICC profiles, such as Adobe Photoshop. Image processing of various parameter changes can now be batched rather than carried out sequentially, vastly increasing the efficiency of applying a number of changes to the same images. The new version of Digital Photo Professional adds the ability to simulate the CMYK separation of images based on regular Japanese, European and USA printing industry practices. Pricing, availability and reader enquiries. 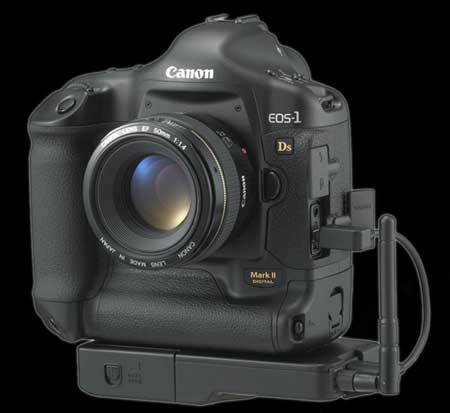 The EOS-1Ds MKII will be available from November 2004 for £5999.99 RRP inc. VAT / €8699.99 RRP inc. VAT. Lots of people still rubbishing the French web site that posted the 2D rumours. They were suggesting they saw a 22MP 1Ds at the olympics (did it have a big 22MP logo? :-) We had a mail suggesting that it will still be the 1Ds Mark II and will have 16.6MP, with a bigger buffer to allow 4 fps for 20 frames (some say 3 fps). Availability for us mere mortals is early next year. Thanks to everyone who sent in the info!. 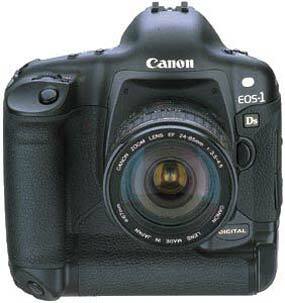 Is it to be the EOS-2D ?. Reports from France ( Chasseur d’Images has a mention on their home page) suggest 22MP and a whole new name?. To be officially annouced the 27th of September. There is some debate as to whether there are two new -big- cameras to come from Canon, since several people have said the 1Ds replacement was delayed until the spring. ISO 100 to 800, then only 1600 and 3200 accessible by custom settings. Faster Wi-Fi and in two ways : the camera can be remotely operated from a computer. Special setting : individual treatment of bright groups of pixels to avoid or delay overexposure and improve dynamic response. Same body as D2H, except a minor improvement on the vertical grip. Improved (!) 3D metering system – still 1005 rvb pixels but new algorythm. Interesting to see the mention of DxO. Keith recently did a short review of the DxO software, and is looking forward to trying out the raw processing version. How similar is this to the Kodak ‘lens optimisation’, that has had a mixed reaction from some? Nothing new to report! This of course leads to suggestions that the new version of the 1Ds won’t appear until PMA in February (see the comments from mid July). 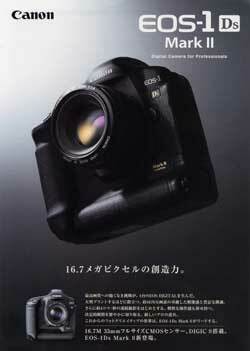 We’re still expecting Canon to announce something big at Photokina, certainly if Nikon come up with something good. Until Photokina, Keith is going to be visiting the US (Oregon coast) to take a few more pictures, but we’ll keep up the search for info! Nothing yet on the 1Ds replacement, but more talk of an EOS 7D (8MP, 1.3x & 4fps) A better built (solid cast body) version of the 20D with a 1D Mkii type of sensor. Probably the same as the ‘3D’ below. October delivery? We hear from someone in the UK contacted by their dealer, asking if they would like to pre-order a 1Ds Mk 2 … delivery expected in October. 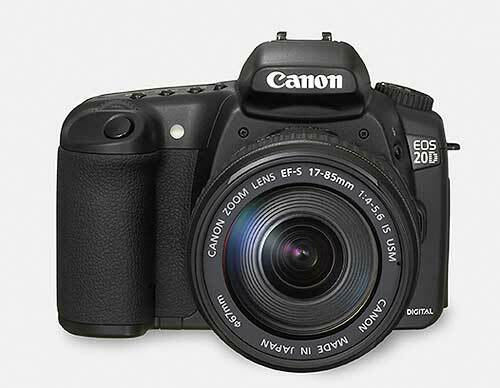 Some people still hoping for an EOS-3D which would sit in between the 1D Mk2 and the new 20D. The best money still looks to be on the 1Ds Mk2 at Photokina (info about event). Seems that there is info in the September issue of Rangefinder. Also, there might be several other manufacturers knocking at the 11MP full frame sensor market. The full frame sensor from Dalsa could soon be in several cameras. Latest wave of wishing now includes eye activated focus as per the Elan (ECF – Eye Controlled Focusing). There is the point however that this technology is not new and has not yet made it into any of the other DSLRs. I suppose what -I’d- like would be the functionality of my 1Ds in a box the size of my old OM2 (see the first pic in my original article on the 1Ds, for the comparison :-) 70’s retro design anyone? It seems that even the ‘usual’ reliable sources are finding that Canon has gone very quiet. Perhaps two new cameras? One to replace the 1Ds and either (take your pick) a new ‘mid-range’ (possibly full frame) ‘pro’ camera between the 20D and 1D MkII or even a really high MP assault on the medium format market. There is also the story that Canon have not made any new 1Ds for a while. Big news on the rumour mills. It seems Canon is inviting dealers to a big event (in Stockholm) on the 5th September (a Sunday). They are billing it as the ‘biggest news since 1994’. Of course it could just be a new range of printers… I believe the EOS1n was launched ten years ago? What’s it to be? a 2D ? 1Dsn? Maybe an entirely new system — seems a reasonable time for all us EF lens mount users to buy new glass -NOT. 8.2Mp 22.7×15.1mm sensor, ISO 100-3200, ETTL II, Digic II, 5 FPS, 25 pic buffer, EF-S 17-85/4-5,6 IS USM lens. 17 August – Someone ‘claims’ (dpreview forum) to have one on order at $6499 – they didn’t say where! “(dealer) was told it would be 14.3 mega-pixel and 5fps. Thats pretty much what Ive heard numerous times from several “in the know” reliable people. The 10D followed the D30 by about two and a half years, at 1.4x (the square root of 2) the pixel pitch and 65% of the price. On a cycle roughly one year later, the 1D Mk II followed the 1D by about two and a half years, at 1.4x the pixel pitch and 65% of the price. If the ratios hold true, the “1Ds Mk II” should follow the 1Ds by about two and a half years (announcement Feb. 2005), at 1.4x the pixel pitch which would = 22MP) and 65% of the price ($5500). Anyone have any more figures? 14 July. A comment from a senior Canon CPS person in US that they had not heard of a replacement. 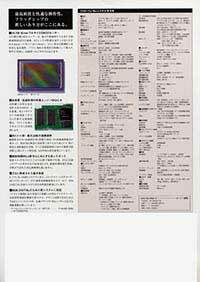 As of mid June, 2004 Canon is saying that the 1Ds is no longer available. This suggests that the replacement for the 1DS is on its way. Best suggestions point to at least 16 megapixels and vastly reduced noise at higher ISO ratings. We have been asked by several people if they should buy a new camera or wait before buying. The answer depends very much on why you want the ‘new’ 1Ds. Keith has a 1Ds and was looking for a second SLR body – not essential and the current one is great, so a wait does not really matter. If you are looking to move up to the ‘big league’ from another camera, then it’s really about whether you want the huge jump in performance now, and can justify the expense. Don’t forget that the 1Ds mercilessly exposes the faults of your ‘cheap’ lenses. and that will only be more so with any new camera.